From the time I was 7 y.o. my parents had a summer house in Trafalgar Street which is in Kemptown about 10 minutes walk from the sea. To my dismay this meant that whilst my friends travelled abroad for their summer holidays I was forced to spend 6 weeks away from my friends in swinging North London. If I was lucky my best friend Robert was allowed to spend his holiday with us. 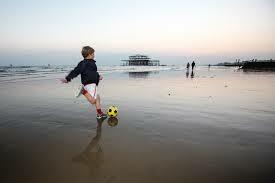 We were always playing football on the beach or cricket in the gardens around the Royal Pavilion. One evening Robert kicked the ball into the sea. This was a time when a football was precious, it cost at least a months pocket money and we watched in dismay as it floated off on it’s way to France. Stupidly, we decided to swim after it. Thankfully neither of us got hurt but we had to walk home in wet clothes and incur the wrath of my parents. My last visit to Brighton was to spend time with my mother in her final days. I learned much about life in Brighton; not to talk to strange men, not to be on the beach when the Mods and Rockers turned up, not to eat candy floss until it makes you sick, not to waste all my pocket money in the penny arcades, and later that is a long cycle to Brighton from Islington*** … enough of this – there is a game today!! Given yesterday’s spectacular results we cannot go into the game with anything but total focus. Right now we can laugh at City, Spurs, MU, L’pool, S’ton,and especially Chelsea – we don’t want to reduce their fans hurt by being another victim of a lower league team. With the return to the first team of both Mesut and Theo we should be safe. It will be interesting to see what defence Mr Wenger picks – I would give BFG a rest and play Chambers. However, as Cup Holders we have to play our strongest team. No slip ups against a team who have struggled but will be desperate for a win. Plus they are managed by an old Miscreant, Chris Hughton – apparently a likeable chap but clearly mentally scarred from his time in the cess-pond. We are on a very good run and the win at the Etihad must have given huge confidence to the squad plus it seems we have shiny new CB.